So you’ve got a business. You’ve told your friends and family about said business. You’ve asked them to like your Facebook business page and have them invite their friends to like it as well. You’re hitting the maximum amount of reach you can but you want more. Lucky for you, for a small fee, you can boost any of your posts to reach a larger, broader audience or you can reach a targeted audience. Why is this important? Every day, millions of users browse Facebook - whether it’s for five minutes or two hours. These windows of time provide you the opportunity to get those eyeballs on your business. One tip that I like to remember is to always boost your strong posts. You can find the impressions and engagement rates under the Insights page on the top of the Facebook business page. If you boost an organically strong post, chances are the boosted post will do that much better. That and you don’t want your future or returning customers to see posts that aren’t as strong. Always put your best foot forward. I cannot emphasize enough how pertinent it is to know your audience and know your client. Here at TBD, we pride ourselves on both. I’d like to turn to an example of our most successful boosts for Siena, a beautiful fine-dining Tuscan restaurant in Austin, TX. We all know restaurants thrive on good reviews but what if you’re not getting any reviews at all? Your next step would be to post on your business page and ask for your customers to let you know how you’re doing! Our initial post reached 1,000 impressions organically, which is great! It was already a more successful post of the week. So when I went to do my weekly post boostings it was no question that I would continue our call-to-action review post. Boy, did it blow up. As you can see, we reached 3,700 more eyes (impressions) after boosting and we got a crazy amount of engagement. We received 463 reactions (those are your likes, ha-ha’s, hearts) and also had 45 comments between the original post and shared posts. Along with this, Siena ended up receiving four positive reviews on their page! From a $35 boost, we tripled our reach and received positive feedback ONLY. 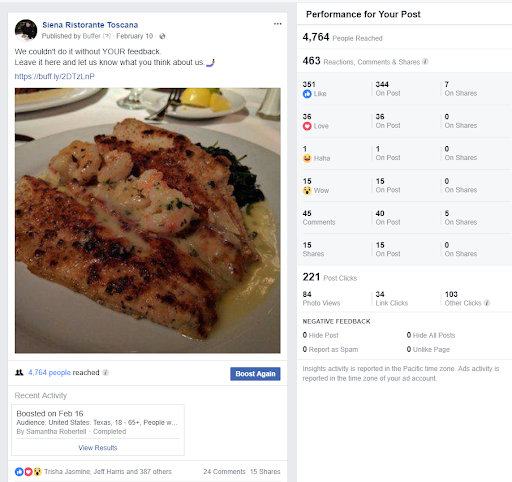 Positive feedback is always important but with Facebook’s algorithm, negative feedback will deem posts less authentic and less favorable in your feed. In business, you have to spend money to make money. Facebook boosts, even for the smallest amount of dollars, make it simple to understand while also giving you major insight into your audience and potential audience. Want to learn more about Facebook audiences, targeting ads and boosts? Leave a comment or hit us up on Twitter or Facebook to learn more!